This is a 2½-storey, cross-gabled British Arts & Crafts house which combines Queen Anne and Tudor Revival features. There are gable-roofed dormers on either side, flat-roofed dormers behind each gabled dormer, and two box bays on the right. An octagonal turret on the right front corner forms the roof of a two-storey angled bay; the upper bay is jettied over the lower. A stepped brick chimney separates the turret from the front gable. There is a prominent angled oriel window on brackets in the lower gable with a small paired window above. To the left of the oriel is a gabled roof over the inset porch which is supported by paired square posts on a concrete balustrade. The stairs which are faced in brick have low, sloped concrete balustrades. The house has multiple leaded windows and windows with wooden muntins. The upper front gable, upper tower and rear dormer are shingled; the upper floor walls and gable are stuccoed and half-timbered, with bevelled siding on the square bays. The lower floor is of brick and the foundation is scored concrete parging on brick. Distinctive Tudor Revival features include the half-timbering, the oriel and the jettied turret. 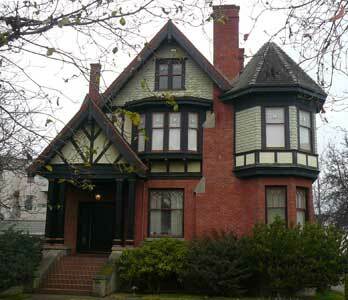 In the 1970s the house was purchased by Norwich Life Insurance Co. The company restored it for their offices, and won a Hallmark Society Award in 1975. This house replaced an earlier structure on the site which was there prior to 1891, when it was owned by the estate of Joseph Heywood. Contractor Thomas Anderson Brydon (b. Selkirk, SCT, 1855-1920) was prominent both professionally and politically. He apprenticed in Edinburgh as a carpenter and joiner. He married his wife Mary Ann there in 1884. 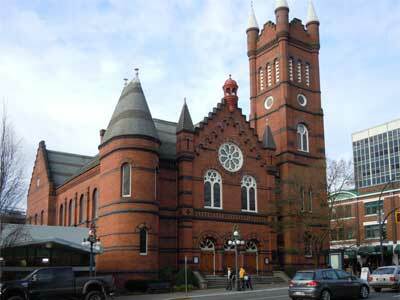 They came to Victoria in 1885 and by 1889 Brydon was Clerk of Works for the construction of St. Andrew’s Presbyterian Church (924 Douglas St, Downtown). 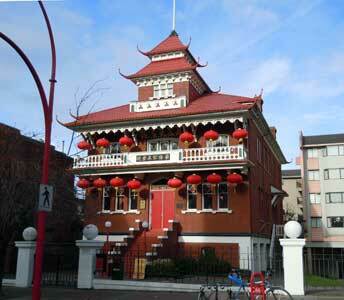 He constructed many buildings, including the family home at 1264 Denman St, the Janion Block and the Chinese School (636 Fisgard St, Downtown). Brydon served on Victoria City Council from 1899-1901. About 1900 Thomas and Mary Ann moved to Glanford Av, where they established an orchard, and in 1906 Thomas became the first Reeve of the newly formed Saanich Municipality. 1906-09: Thomas Wilson Paterson (b. Darnel, Ayrshire, SCT, 1851-1921) was BC’s Lieutenant-Governor immediately before WWI. He came with his family to Canada West in 1854. His first job was shovelling dirt for railway track along the Welland Canal and at the head of Lake Superior. He worked his way up to partnership in the firm, then moved west, laying track for the CPR. In 1883 his firm won the contract to build the E&N. He built the Victoria and Sidney Railway, which opened 1894 and then became general manager. He also had a 1600 acre farm, Inverholm, at Ladner and invested in shipping and lumber mills. Paterson married Emma Elizabeth Riley (b. St. Catharines, ON, 1865-1944), daughter of Sen. George Riley, in 1886 in Victoria. Paterson entered politics as a BC MPP in 1902. He was elected president of the Victoria Board of Trade in 1905, but promoted big business interests over the small businessman. He was defeated when he ran for Mayor in 1907, and lost his seat in the legislature two weeks later. However, in December 1909 when James Dunsmuir resigned in the middle of his term as Lieutenant-Governor, Paterson took over. During his term of office he and Emma welcomed the Duke and Duchess of Connaught and daughter Princess Patricia to Government House. Paterson commissioned landscape architect and engineer G.K. Maclean for the first overall grounds plan. Following his retirement in 1914, he and Emma moved to the Uplands and developed a spectacular garden. 1909-16: BC Surveyor-General George Herbert Dawson (b. Quebec, 1866-1940). His sister Mary Fry Dawson (b. Quebec, 1864-1954) came to Victoria in 1911 to live with him. They resided at 1020 St. Charles St (Rockland) from 1923 until their deaths. 1916-25: Bernard “Casimir” Mess (c.1860-1925) and Florence (née Bramall, b. London, ENG, 1868-1949). Until his death Casimir Mess was manager of Findlay, Durham and Brodie, marine agents and insurance brokers; the company sent him from London, England, to Victoria in 1894. Living with them were their offspring: Chemist and dentist Charles Bertram signed up with the CEF in May 1918; Elsie Florence; stenographer Eva Beatrice was for 18 years a secretary at Ryan Hibberson Timber Co until retiring in 1957; Percy Bernard signed his attestation papers in April 1916 for the CEF in WWI. Casimir was active in the Chamber of Commerce and sang in the Arion Male Voice Choir for over 30 years. Florence and family left the house after Casimir’s death. 1927-28: From Birkenhead, England, Thomas, Cecil T. and mechanic Harry Sinclair Jones of Jones Bros. Two others from the firm, W.H. and Leonard Jones lived on the street behind at 1166 View St. Jones Bros had a battery service station at 928 Johnson St and an automobile service station at 866 Yates St. Tenants: 1929-42: Edith Mary “Faith” (née Leeder, b. Leamington Spa, ENG, 1897-1985) and George Collins “G.C.” Grant (b. Rangoon, Burma, 1888-1956) married in Victoria in 1921. [Note: Faith came to Victoria in 1907 with her father Dr. Forrest Bertram Leeder and mother Edith Mary (1369 Rockland Av, Rockland). Dr. Leeder had a practice with Drs. Hudson and Helmcken. The Leeders had three daughters, Faith, Hope and Charity. Hope married engineer Norman Alfred Yarrow of Yarrow Shipyards in 1915.] G.C. Grant came to Canada in 1912 from Edinborough, Scotland. He served in the Canadian army during WWI; according to family lore, he spent time in a German POW camp with Maurice Chevalier, teaching him English. G.C. was a Bank of Montreal accountant, and played bridge, cricket, rugby, tennis and badminton. Faith opened The Connoisseurs Shop in 1162 Fort on April 1st, 1929. About 1941 the Grants moved home and shop to 1156 Fort St.
1945-46: Can Govt NHA apartments. 1947-51: 5 apts, #301: William Merwyn and Frances Elizabeth Hord; William worked in the gas division of BC Hydro.